Additional research provided by Robert C. Kenzer. Business directories have been published in North Carolina since the beginning of the nineteenth century. Many extant directories provide a valuable contemporary portrait of the business community of the entire state as well as other interesting county and municipal information. One of the earliest examples of a directory of North Carolina businesses is the Commercial Directory, published by J. C. Kayer & Company (Philadelphia) in 1823. This publication, based on the 1820 U.S. census, lists businesses in three of the state's largest towns: New Bern, Fayetteville, and Wilmington. 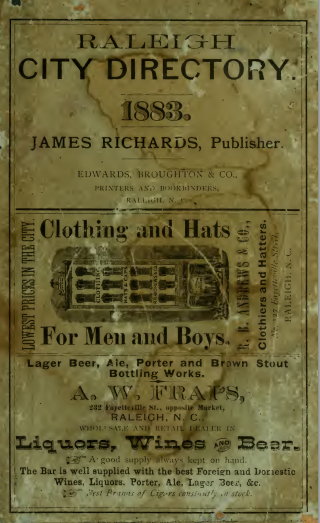 Pre-1900 city directories also exist for Wilmington (1860-61 edition), Asheville (1883), Charlotte (1875), Durham (1887), Greensboro (1879), New Bern (1880), Raleigh (1880), and the Winston-Salem area (including Greensboro, 1879). Typically, these volumes have an alphabetical list of the names and addresses of residents and businesses, a street address directory, and a classified business directory. These directories usually include a numerical list of telephone subscribers. 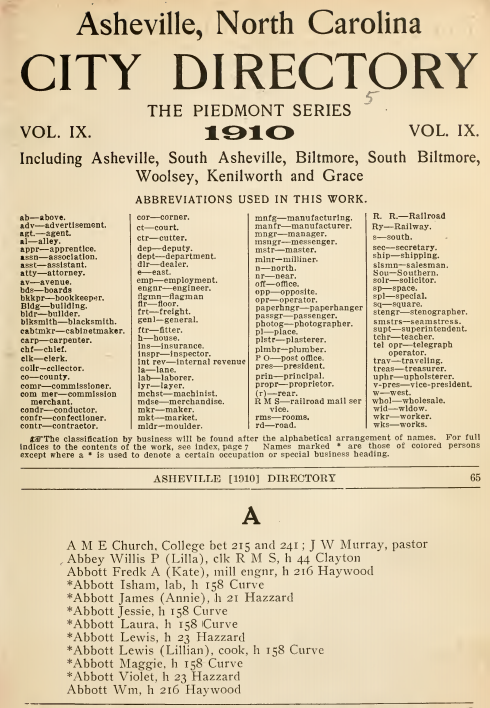 Between 1867 and 1897, Levi Branson, one of North Carolina's leading publishers and booksellers, compiled and published nine editions of Branson's North Carolina Business Directory. Organized by county, Branson's Directory includes the names of business firms under such headings as blacksmiths, grocers, dry goods stores, and restaurants. The names of all municipal and county officeholders, as well as U.S. officials who held posts such as customs collectors, are also listed. In addition, the volumes include the names of a wide variety of other professionals and institutions in each county, such as schools, attorneys, ministers, physicians, and postmasters. Importantly, the directories also note if businessmen and other community figures were African American. Some leading annual directories of modern North Carolina businesses and manufacturers are the North Carolina Business Directory (1988- ), North Carolina Manufacturers Directory (1993- ), North Carolina Manufacturers Register (1994- ), and Regional Industrial Buying Guide: Greater Carolinas (1990- ). The 1998-99 edition of the North Carolina Business Directory covers some 300,000 businesses. The North Carolina Manufacturers Directory, covering about 11,000 companies and more than 26,000 personnel, is compiled in cooperation with the N.C. Department of Commerce. 1 January 2006 | Kenzer, Robert C.; Williams, Wiley J.